Draw specialists Brackley Town picked up another Vanarama National League North point but were robbed of all three by a late equaliser at Stockport County. Kevin Wilkin’s side drew 1-1 at in-form County in Saturday’s clash in front of nearly 3,500 fans at Edgeley Park where Saints again paid the price for not taking their chances once in front. 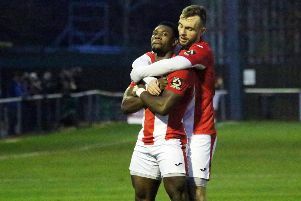 A tight first half of few chances gave way to a second half dominated by the visitors who led through Lee Ndlovu and only a stoppage-time equaliser from substitute Frank Mulhern denied Saints what would have been a deserved win. Ndlovu put Saints ahead on the hour mark with a beautifully worked goal. Ndlovu was involved in the build-up as the ball was worked to the left for Connor Franklin to drill low and hard into the centre where the striker finished neatly. 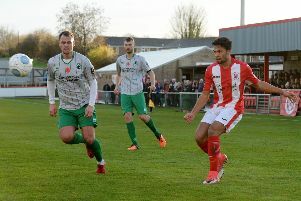 Connor Hall’s header was cleared off the line, Matt Lowe slalomed the length of the pitch like a high speed towed caravan only for his shot to be deflected wide and Ben Hinchliffe saved well from Ndlovu after he was put through by Jimmy Armson as Saints had County on the ropes. Stockport manager Jim Gannon was dismissed to the stands after late touchline skirmish and the vocal support for the home team spurred a few late moments of pressure that brought a corner deep into stoppage-time. Scott Duxbury hit the in-swinging corner to the near post and Mulhern’s run from the back post created the chance for his glancing header find the back of the net much to the delight of the raucous delight of Hatters supporters.